For his commission, Divecha introduces an alteration in the French Railway schedule, by delaying a train (with the support of SNCF, the French National Railway Corporation). Train No.13107 (Paris to Rouen) scheduled to depart from Gare Saint-Lazare on 4th October, 2017 at 12:19PM, was delayed by 5 minutes—departing at 12:24 PM instead. A miniscule ripple in the system, this delay is an artistic gesture that questions our relationship with time, light and the railway industry, while initiating a conversation with Claude Monet’s ‘The Gare Saint-Lazare’ (1877), displayed at the Louvre Abu Dhabi. The 19th century spread of railways was instrumental in structuring time. Until then, in Metropolitan France, each town maintained local solar time (measured with a sundial). The difference between individual towns’ local times was considerable (e.g. when it was 12:00 PM in Paris, it was about 11:51 AM in Le Havre, and 12:12 PM in Marseille). Non-uniform local time demanded dual clocks at stations (showing railway time and local solar time), and complex timetables for passengers. As railroad networks expanded, the railway industry began to standardize time for effective scheduling. The year 1891 saw two crucial introductions. Firstly, Paris Mean Time was adopted as the Standard National Time. All French towns were ordered to adjust their station clocks to Paris Mean Time to coordinate the railways. From the cycles of nature, time was now dictated by the cycles of commerce, further establishing the centrality of Paris. Simultaneously, in 1891, the French Railways began running trains 5-minutes behind scheduled time. This delay was introduced for the benefit of non-punctual travelers, remaining in effect until 1911. The elimination of this delay illustrates our relationship with modern time, as it aligned man, machine and clock, emphasizing the interdependence between time and value. Curiously, in the late 1800s, Monet had also considered delaying a train, while developing Gare Saint-Lazare as his subject. He desired to delay a train to Rouen by half an hour, since the light would be better to create his plein air painting. Monet’s relationship with natural light was paradoxically employed in his paintings, to celebrate modernity and the railways (that would fracture our relationship with light). The 5-minute delay that triggers ‘Train to Rouen’ (2017) revives an obsolete railway process to understand how we consume time today, while paying homage to Monet. An ephemeral gesture, the delay was visually registered on the ‘traffic occupation chart’ - produced daily, this internal railway document is a 24-hour graphic timeline, marking the waiting time of trains at the various platforms at the Gare Saint-Lazare, a terminal station. An extract from this document representing 10AM - 3PM (5-hours) is translated into a large-scale artwork by the MTX team and Divecha. The complex sections, arrangements and colours of the woven artwork have a logic, resembling that of a systematic graphic score. 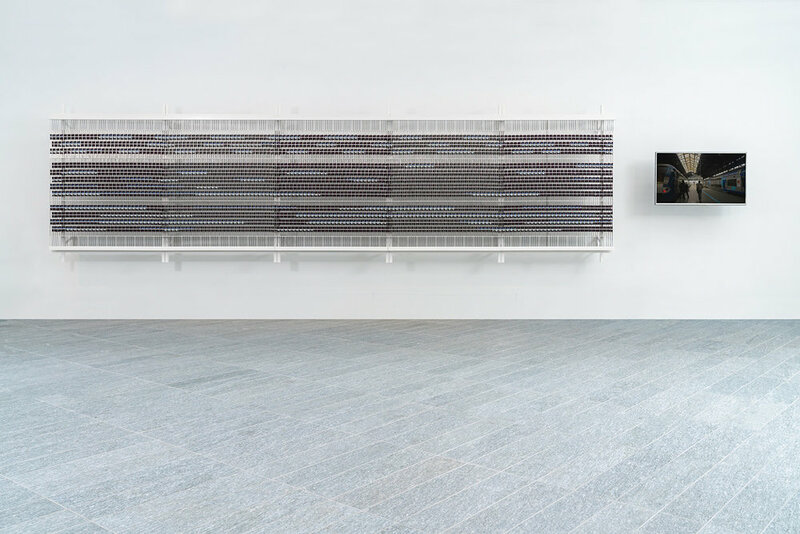 The length of the artwork represents the 5-hour extract, further divided along the horizontal axis into hours by alternating Violet and Grey ribbon sections running across the frame. The polished pipes fastened from top to bottom at equidistant intervals further divide the timeline into 300 minutes (5hrs x 60mins). White slats running in between represent 12 platforms on the vertical axis. Each pair of parallel running Blue and White ribbons interspaced across the artwork indicate a single waiting train. The blue ribbon indicates theoretical time, the white one, practical time. The left end of the ribbons marks arrival time, the right, departure time. A blue ribbon above a white ribbon of similar length denotes the train ran as per schedule. However, when the white ribbon is lengthier, one can deduce a delay occurred. By decoding this system once can locate the 5-minute delay on the artwork that took place at 12:19PM. Formally, the tension between the cage like architectural structure and the twisting ribbons illustrates the dichotomy between structured time and fluid time: this aesthetic scheme is informed by ‘The Gare Saint-Lazare’ (1877), where the collision of the roof grid and billowing smoke signals the fraught relationship between the inorganic and organic, the static and non-static. Additionally, the horizontally extending ribbons illustrate the notion of time as an infinite continuum, while the interspersed vertical ropes represent the paradox of dividing time into instances. Video footage of the delayed train, referencing Monet’s composition, further evidences the delay. ‘Train to Rouen’ (2017) recalls a period when time was still understood with a degree of malleability, as being inclusive. In turn, today, our contemporary condition (and its expectations) urges us to comprehend time through anticipation, anxiety and stipulations. Skipping a beat, this 5-minute delay is a symbolic gesture that resists understanding capitalism as pressure, and time as constraint. The artist would like to thank everyone at MTX Architectural Embroidery; The SNCF team: Sébastien Fracin - BHL Deputy / In charge of Adaptation, Benjamin Huteau - Saint- Lazare Station Director, Philippe Lancastre - Production Director, Guillaume Madroux - Production Deputy & Transportation Design Manager, Joris Merlon - Head of Circulation at Saint-Lazare station, Pascal Rambault - Deputy Leader of Circulation at Saint-Lazare station; Richard Thomson, Debra Levine, Murtaza Vali, Kevin Jones, Melissa Gronlund, Quentin Labail, White Light Studio. The length of the artwork represents the 5-hour extract. 5 alternating sections of broad Violet and Grey ribbons running across the frame further divide the artwork into hours along the horizontal axis. The polished pipes fastened from top to bottom at equidistant intervals further divide the timeline into 300 minutes (5hrs x 60mins). 12 rows of white slats running in between represent 12 platforms on the vertical axis. Each pair of parallel running Blue and White ribbons interspaced across the artwork indicate a single waiting train. The blue ribbon indicates theoretical time, the white one, practical time. The left end of the ribbons marks arrival time, the right, departure time. A blue ribbon above a white ribbon of similar length denotes the train ran as per schedule. However, when the white ribbon is lengthier, one can deduce a delay occurred.